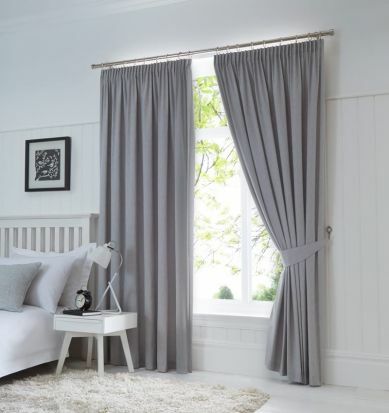 Home » Dijon Ready-Made Blackout Pencil Pleat Curtains - Silver 66"x54"
Dijon Ready-Made Blackout Pencil Pleat Curtains - Silver 66"x54"
The Dijon Ready-Made curtains are a plain design, making them ideal for blending with a wide variety of wallpapers, paint colours and carpet designs. Each of the designs has blackout lining, which helps reduce both external light and sound. This can make them especially good for bedrooms, but their plain design means they are suitable throughout the house. The blackout lining can even reduce energy bills by helping to keep rooms warm in the winter and cool in the summer! The pencil pleat curtains have a tape heading, so they can be hung from tracks or poles. Available in 4 colours (natural, silver, denim, and blush), and 4 sizes (66”x54”, 66”x72”, 90”x72”, and 90”x90”).